Part 1 General issues: Defining functional foods; EU legislation and functional foods: a case study; US legislation and functional health claims. Part 2 Functional foods and health: Colonic functional foods; Coronary heart disease; Antitumour properties; Functional foods and acute infections. Part 3 Developing functional food products: Maximising the functional benefits of plant foods; Developing functional ingredients: a case study; Functional fats and spreads; Functional confectionery; Probiotic functional foods; Dietary fibre functional products. Functional foods are widely predicted to become one of the biggest dietary trends of the next twenty-five years. The editors of this book have gathered together leading experts in the field in order to provide the food industry with a single authoritative resource. 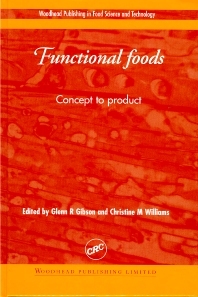 This book first defines and classifies the field of functional foods, paying particular attention to the legislative aspects in both the USA and EU. It then summarises the key work on functional foods and the prevention of disease. Finally, there are a series of chapters on developing functional products.